For elite athletes, and their families, sacrificing education in pursuit of the dream has its challenges at career end. Let’s start with a hypothetical situation. 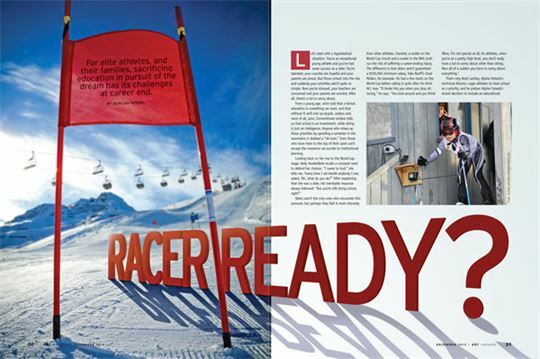 You’re an exceptional young athlete and you’ve had some success as a skier. You’re talented, your coaches are hopeful and your parents are proud. But throw school into the mix and suddenly your priorities aren’t quite so simple. Now you’re stressed, your teachers are concerned and your parents are worried. After all, there’s a lot to worry about. From a young age, we’re told that a formal education is something we need, and that without it we’ll end up stupid, useless and, most of all, poor. Conventional wisdom tells us that school is an investment, while skiing is just an indulgence. Anyone who mixes up those priorities by spending a semester in the mountains is dubbed a “ski bum.” Even those who have risen to the top of their sport can’t escape the reverence we ascribe to institutional learning. That’s why Brad Lashley, Alpine Ontario’s technical director, urges athletes to treat school as a priority, and he praises Alpine Canada’s recent decision to include an educational component as a contractual requirement for membership on the national development team (depending on age and academic experience). But for many would-be athletes, their biggest fear is one that’s been drilled into them for years—that school is an essential step on the road to success. But what if it’s not? Consider for a moment what Tremblant skier Erik Guay’s career might have looked like had he decided to play it safe by attending university. Would he have been better off? “I pretty much knew that I could get a scholarship,” he says, “but I didn’t end up applying because I wanted to keep going in skiing, and the year that I decided to keep going, that’s when it really took off.” Thomas Grandi doesn’t regret his decision, either. “When I got to 30-32 years old, and I still had not really achieved what I set out to do, there were times when I seriously considered stopping…and if I had a job offer because I had finished a degree in something or other, maybe I wouldn’t have kept going.” Grandi did keep going, and he wonders whether it was “desperation” that gave him the drive to win his first World Cup at 32 years old. Sure, schooling may provide a certain degree of security, but if that’s where its value lies, where does that leave excellence and the risks that go along with it?Looking back on his career as a World Cup champion and two-time Olympian, Cary Mullen recalls his father, a school principal, encouraging him to take a risk by fully committing to the sport after high school. Like Dueck, Guay and Grandi, Mullen doesn’t regret the choices he made. “I’ve talked to lots of former athletes,” he says, “and I’ve never ever heard one say, ‘Gee, I wish I’d retired sooner than I did.’” In fact, he suggests that the athletes who tend to have regrets are the ones who could have invested more of themselves into the sport. But surely, in this day and age, it doesn’t have to be an all or nothing decision, does it? Athletes now have access to online courses and specialized programs that cater to travel schedules. Take halfpipe superstar Roz Groenewoud, for example. She’s enrolled at Quest University in Squamish, B.C., and hopes to have her bachelor’s degree completed by the time she starts transitioning out of competitive skiing. But not everyone agrees with Podivinsky. According to Brooker, “You end up being mediocre at a whole bunch of things if you’re trying to accomplish too much.” Erin Mielzynski echoes this sentiment, calling herself a perfectionist. “I could try to do both,” she says, reflecting on her deferral to both Guelph and Dartmouth universities, “but I just feel like I would only do both halfway, and right now I’m focusing everything I have on skiing.” With Canada’s first gold medal in slalom since Betsy Clifford’s in 1971, Mielzynski’s focus certainly looks like it’s paying off. Bev Oakley, principal at Whistler Secondary School, notes that this focus and dedication isn’t uncommon for students who are also elite athletes. “One of the things we have found is that our top athletes are also our top students,” she says. The National Ski Academy in Collingwood, Ontario, also emphasizes academic excellence, boasting a 100 per cent graduation rate, with students gaining acceptance to their universities of choice. Jeff Lackie is a graduate from the National Ski Academy and currently head coach of the Ontario Women’s Ski Team. While such programs do offer a flexible schedule to suit the needs of racers, Lackie cautions students and parents who are looking for a quick fix: “If it sounds too good to be true, it’s too good to be true.” He’s come across a lot of parents who expect the Academy to deliver report cards with an 85 per cent average, and he worries that such expectations don’t account for the level of dedication required from athletes themselves. There’s also the problem of cost. While the Whistler Sport School is a public institution, other programs like the National Ski Academy will set you back about $30,000 per year. Roz Groenewoud managed to get a scholarship to Quest University, but most people will end up paying something in the neighbourhood of $29,000 in tuition alone. While these numbers pale in comparison to the fees at some American ski academies, they aren’t exactly accessible to the average family. But opportunities do exist. Some talented young skiers like Trevor Philp have taken advantage of scholarships to American universities while competing for team Canada. Philp acknowledges that it might be a few years before he’s ready to become a force on the World Cup, but in the meantime he’s content to pick up a degree from the University of Denver while gaining experience alongside some of the world’s best skiers. Despite all these opportunities to ski and study at the same time, a common refrain from elite athletes is that, unlike skiing, school will alwasy be an option. In fact, Sport Canada offers athletes $5,000 in tuition assistance per year of national carding (up to a maximum of $25,000). Since 1977, 85 alpine members and 70 freestyle members have taken advantage of this incentive. The program was extended to para-alpine skiers in 1996, and since then 17 have received support. But what about skiers who are not competing in the traditional sense? Is their contribution to the sport any less valuable? When JP Auclair of Sainte-Foy left school to join the Canadian Freestyle Team, his parents were supportive. It wasn’t until he decided to pursue a film career that his father had second thoughts. “He had no way to relate to what I was talking about,” recalls Auclair, “so that was a little bit more scary almost than dropping out of school.” In addition to becoming a legend in the sport, Auclair’s decision to drop out of design school ultimately led to a career in that field. Not only is he a professional athlete, but he’s also one of the founders of Armada skis. His career is the result of passion and talent, not the product of a degree. When it comes down to it, a lot of people spend their college/university years figuring out what they want to do and whom they want to be. If you already know the answer to those questions, what’s the harm in devoting yourself to your dreams? Mélanie Turgeon is a prime example. She knew what she wanted to do at a young age, and she wasn’t prepared to put her World Cup plans on hold. 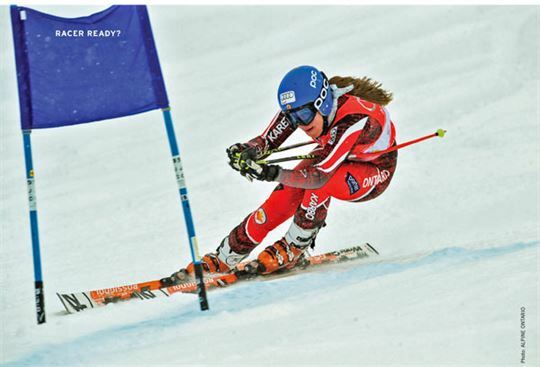 “I always knew that ski racing was my priority,” she says, “and whenever that would be over, then there would be other opportunities.” In other words, school will always be there, but youth won’t. Sure, not everyone will be successful. Some athletes will lose interest, some will get injured and some just won’t cut it. But in the meantime, why not remove a few of the obstacles that prevent young skiers from getting their shot. When Stemmle was competing in the World Cup, his high school wouldn’t even grant him a phys-ed credit for his racing. Although he persevered, many young athletes would have simply given up on their dreams. But this tension between skiing and schooling doesn’t have to exist. Some skiers study German to make competition in Europe more manageable. Some schools, like Ontario’s Blythe Academy, teach athletes about agent representation and working with the media. Some skiers simply apply the skills they’ve developed to life after sport. It’s tempting to view education and athletics as opposing forces, but that doesn’t have to be the case. Most elite athletes will tell you that somewhere along the line, they’re getting an education, whether school’s a part of it or not. The decision to attend university while continuing my pursuit of World Cup and Olympic racing is not one I’ve regretted—in fact, it’s helped me rediscover my passion for the sport. It’s about self-motivation and discipline. When on the Canadian or Alberta ski teams, there’s always a schedule to follow and a lot of guidance in all aspects of the sport, from skiing to physical training. In first year at the University of Denver (DU), I was in Denver when my older Canadian teammates were heading to Europe for their fall ski camp. All I could think about was how they were getting ahead—and how I’d need to make the most of my training in Colorado. When the ski hills opened mid-October, those next few weeks saw me on-hill as much as possible. Hitching rides from Denver with anyone heading to the mountains, I would join whichever team was training that morning—before returning to class in the afternoon. The DU Ski Team would be there a couple of times a week, but I knew I needed to do more than that to keep up with the boys training in Europe. And through this process, I realized how much I loved skiing and racing, but also that I would continue to push like my national team friends, even though I was balancing athletics with full-time school. The biggest problem with full-time university and international racing is trying to fit everything into your schedule. It’s a constant balancing act that I’m not sure can be perfected—I just do my best. It means carrying around my books all winter as I travel the ski circuits, doing homework and studying during the evenings. Without question, both the academics and athletics require sacrifices, but they also complement each other, too. While many of my peers look forward to and consider their “breaks” as time away from skiing, my “breaks” are when I leave school, to go skiing. 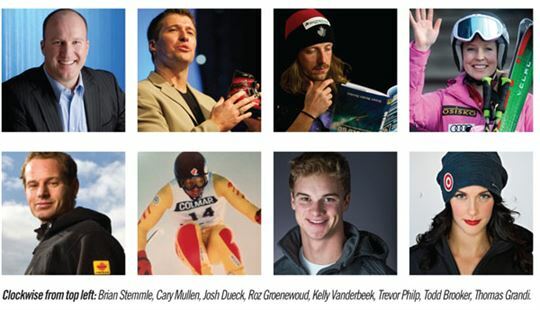 Clockwise from top left: Brian Stemmle, Cary Mullen, Josh Dueck, Roz Groenewoud, Kelly Vanderbeek, Trevor Philp, Todd Brooker, Thomas Grandi.